Klein Basement and Bath Systems provides bathroom remodeling and basement waterproofing services in PA and NY. Ugly and outdated bathrooms can come back to life in as little as one day, with the Klein Bathroom Remodeling systems -- the only ones with an built in antimicrobial agent that will help eliminate bacteria and mold concerns in your bathroom. The company also provides bathtub refinishing and bathtub reglazing services as an alternative to their bathroom systems. Whether you are looking for a complete bathroom renovation, modernize your bathroom with the latest colors, or transform your bath tub into a relaxing spa by adding a whirlpool, trust Klein Basement and Bath Systems to bring all your bathroom remodeling ideas to life! We've been serving homeowners like you in Meadville, Jamestown, Erie and many outlying areas, including Edinboro, North East, Girard, Union City, Fairview, Waterford, Corry and nearby since 1993! 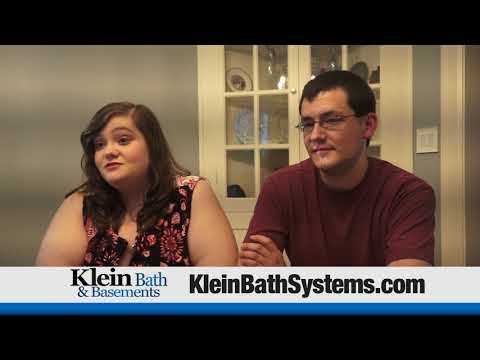 Klein Bath Systems and their happy customers!